Frank Sinatra. Chairman of the Board. Considered by many to be the best singer of the 20th century. There isn’t much more I can say that readers don’t already know or will do him justice, so I won’t try. Let’s just go to the CDs. A Man and His Music first appeared on CD in the U.S. as a Japanese pressing. Specifically, the two CDs were pressed in Japan by JVC. The discs were packaged in individual jewel cases, as opposed to a single double-disc case. Each jewel case has a back insert listing the tracks on the particular disc. The jewel case for Disc 1 contains a booklet, while the jewel case for Disc 2 has a simple paper insert with the album artwork printed on the front side and nothing printed on the reverse side. The catalog number, 1016-2, is shown on each CD. Next to the catalog number in parentheses is 0001 or 0002, denoting Discs 1 and 2, respectively. Both discs have “MADE IN JAPAN” printed at 6 o’clock. Additionally, a legal paragraph at 9 o’clock on each disc ends with “Mfg. by the Victor Company of Japan, Ltd.” The inserts for both discs were printed in the U.S. A barcode is printed in the top right corner of each back insert. Shown below is the cover artwork for A Man and His Music, both Japan-for-U.S. CDs, and both back inserts. 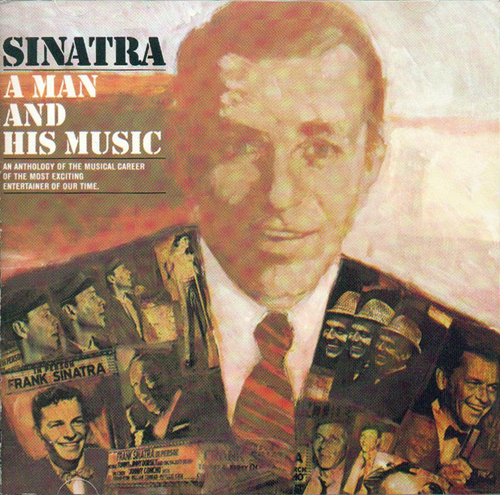 The cover for two-disc compilation Frank Sinatra A Man and His Music (Reprise, catalog number 1016-2). This is the standard cover artwork for this compilation. 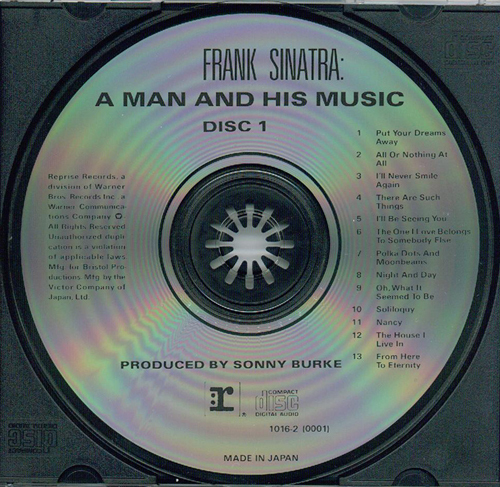 Disc 1 of the two-disc compilation Frank Sinatra A Man and His Music (Reprise, catalog number 1016-2). As noted at 6 o’clock, the disc was pressed in Japan. The paragraph at 9 o’clock indicates that it was pressed by JVC. 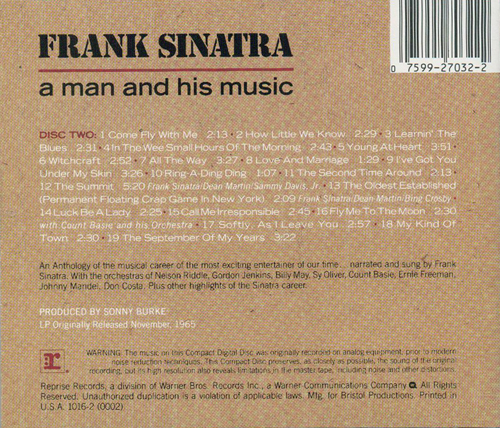 The back insert for Disc 1 of the two-disc compilation Frank Sinatra A Man and His Music (Reprise, catalog number 1016-2). 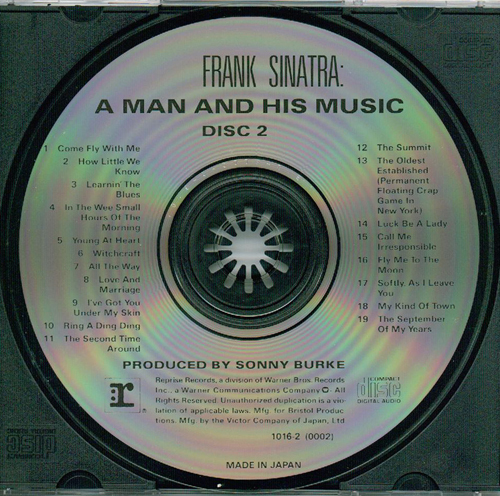 As noted at the bottom, this insert was printed in the U.S.
Disc 2 of the two-disc compilation Frank Sinatra A Man and His Music (Reprise, catalog number 1016-2). As with Disc 1 shown above, this disc was pressed in Japan by JVC. 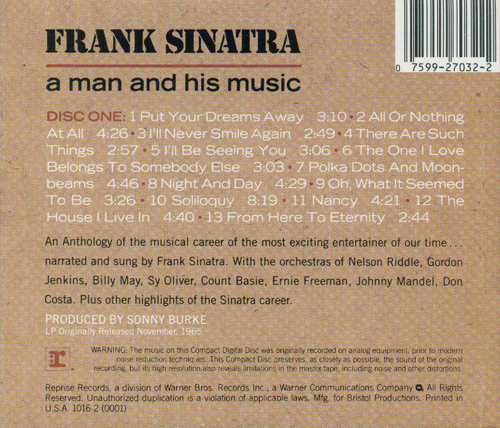 The back insert for Disc 2 of the two-disc compilation Frank Sinatra A Man and His Music (Reprise, catalog number 1016-2). Like the back insert for Disc 1, this back insert was printed in the U.S.